To say that Joslyn Jakoubek, the woman behind the curtain of the equestrian fashion and lifestyle blogging brand JoslynJ Equestrian, nailed it on the head is an understatement. 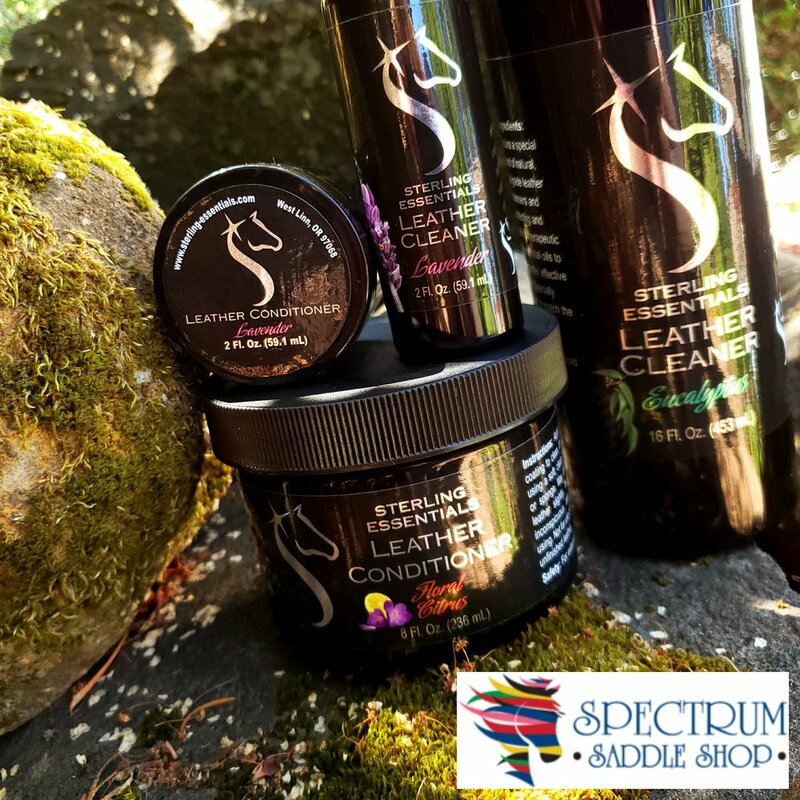 In Joslyn’s recent review of our leather care products, she states, “It’s the best feeling ever to look at your saddle, bridle and boots when they are polished and clean, but getting them to that point, well that’s the beast of the matter.” Oh, how true! Even for us, these weird people who love tack cleaners, we experience the love/hate of taking care of our tack and equipment. So if there is anything that helps soothe that “beast” and makes for more love than hate…it goes to say that most of us are going to come running and hop on board. Which is one reason why we developed our brand of leather care products. This then begs the question…do they work? Well, enter JoslynJ Equestrian. After seeing Joslyn’s social media, blog articles, and photography, it is crystal clear that Joslyn is one very discerning equestrian. As a result, we were thrilled to receive her full review of our products. We won’t give away the whole story, as you’ve just got to read her blog and see her photos. However, let’s just say it has a happy ending! 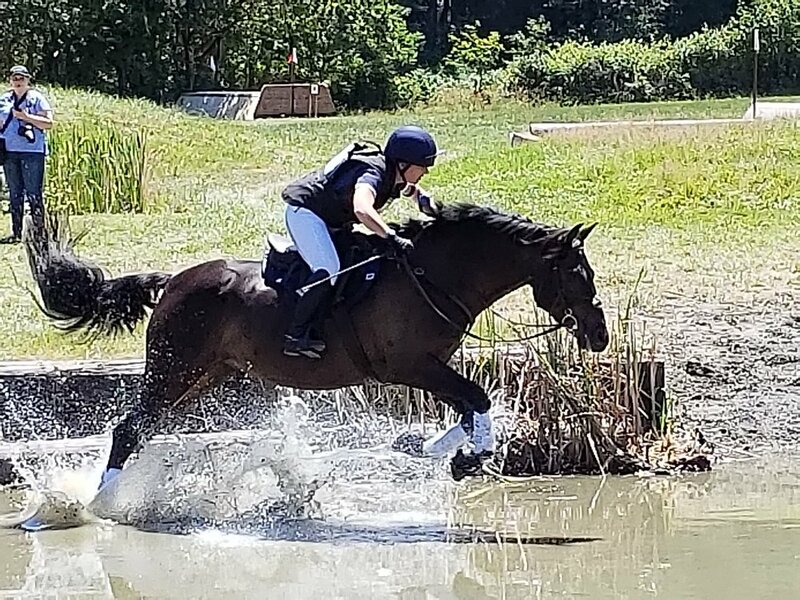 Posted on April 19, 2019 by Teal and tagged Sterling Essentials sterling essentials leather care JoslynJ Equestrian Leather Care Leather Conditioner Leather Cleaner Leather Care Products Equestrian essential oil horses product review equestrian lifestyle. You may have observed that our Leather Cleaners and Leather Conditioners are very similar to cosmetics or skin care products you regularly see in the stores and use. Ah ha, you found us out! LOL! Yes, our products are very similar by design. We want our products to be very gentle, and the principles of leather care are very similar to skin care. However, one key difference between our cleaners and conditioners and your skin care products, as well as many of the other brands of leather care products out there, is that we do not use any glycerin in our products. Zip, nada. Why? Seems weird right? Originally, it came as quite a surprise to us that glycerin is such a no-no for leather. This cosmetics workhorse is used all over the place in skin care - lotions, face creams, the list is long. Ok, so that makes sense because glycerin is a humectant. This means that glycerin actually attracts water to itself, sucking water like a big sponge into your top skin layers - a great property if you want to moisturize your face, but not so hot for ensuring your leather stays healthy. We are huge believers in providing your leather only what it needs to stay in great shape = clean and supple due to just enough moisturizing. To us that means paying attention to our tack and not just slapping on products out of habit when our leather really, really doesn’t need them. Minimalism….Yes!! So….we don’t include glycerin because your leather truly doesn’t need it. Why doesn’t it need it? Read on Macduff! Following from the minimalist theme, we don’t use any conditioners or moisturizes - glycerin or otherwise, in our Leather Cleaner. The objective of cleaning your tack is….to clean your tack. Period. In addition to attracting moisture, glycerin is a sticky substance that can act like a sealant. When included in a cleaner, the glycerin sticks to the very leather you are trying to clean, trapping dirt and grime within the pores and fibers. Plus, that leftover residue of glycerin-dirt-gunk keeps attracting more and more dirt. Talk about counterproductive! Over moisturizing your leather is one of the cardinal sins in leather care. (We could wax poetic on this for quite sometime, but we will save it for another day). Your leather should NOT be conditioned every time it is cleaned. As a result, we do not put glycerin or any other moisturizing agents into our Leather Cleaner. Setting up cleaning and conditioning as two separate leather care steps ensures you have the very best control over the care and health of your tack. You are in the drivers seat to evaluate when and how much conditioning your leather needs to be happy - and dare we say, stay in safe and useful condition. Additionally, we do not include glycerin in our Leather Conditioner. Yes, no doubt glycerin would help moisturize your leather, but at a price. Unfortunately, the glycerin will accomplish this by drawing water vapor from the air into your tack. Water is truly not a benevolent comrade of your leather, resulting in mold, weakened leather, and a whole host of other undesirable outcomes (for more on this check out our article on dealing with water). Also, as mentioned before, glycerin is sticky. I don’t know about you, but I’d get awfully bummed out if my saddle was still sticky and gunky after I cleaned and conditioned it. Yippee, it’s a good thing then that there are other extremely effective ways to supple and condition your tack without using glycerin to draw water into the fibers and cause damage. Ok, so the bottom line is that we are not fans of glycerin in leather care products at all. Like we talked about earlier, yes, leather is essentially just like your skin (our skin is similarly acidic and you can learn about why leather’s acidity matters so much in our article here) and should be treated with the same tender care. However, the difference is that your skin is able to constantly renew and repair itself. Leather is unable to repair itself, so we are the gatekeepers to preventing damage to our leather tack. Interested in learning more? Visit our Learn Page for more tips and how-to or take a peak at our Products! Posted on April 16, 2019 by Teal and tagged Sterling Essentials sterling essentials leather care Equestrian Leather Conditioner Leather Cleaner Leather Care Products glycerin Leather Care leather tack conditioner tack cleaner saddle. Mud is no joke, folks! As you well know….you’re living that dream in the barnyard this time of year. :) If your leather boots are suffering after a trek across the paddock to your pony, then you need to watch our short and helpful video on how to clean your muddy boots with a minimum of fuss and aggravation. A hoof pick with brush. Sparkle, sparkle is just a few moments away….until you trot back across the barnyard again. LOL! How to clean your muddy boots - get easy leather care and leather cleaning tips from Sterling Essentials. Posted on March 27, 2019 by Teal and tagged Sterling Essentials sterling essentials leather care Leather Cleaner Leather Care Leather Care Products Mud Equestrian boots Winter Leather Care Spring Leather Care how to. If you were thinking about some of the very worst things that will wreck your tack, would you automatically think of water? Water is such a sneaky beast and often flies under the radar when it comes to the health of your beloved saddle, boots, and other leather equipment. Although it’s Mother Nature’s ultimate cleaning agent, water can very quickly do some serious damage to your leather goods. This is why we’ve named it one of the 7 worst enemies of your leather. In this first installment in a series of 7 articles, we will share with you the know-how you need to help your leather tack and boots avoid water damage. As April showers loom on the horizon, we can definitely see some rainy days and soggy tack in your future, so now is the perfect time to dive into this! Although water seems benign, getting your leather wet actually causes the leather’s fibers to swell. You’ve probably noticed this when your boots have gotten wet. When wet they may feel a little plumper and softer. Unfortunately, the fibers become permanently weakened when they swell too much. In addition to weakening the leather, water exposure also ultimately causes your leather to shrink and crack over time since leather’s structure changes and does not dry to its original full shape after being wet. Also if the leather is stretched while wet, the fibers become weaker still. Ever observe that wet leather seems to be a little more stretchy than usual? You might have used the trick of wetting a new pair of tall boots and then wearing them until they dry, essentially stretching the leather out to conform to your foot and leg. Although this might be a way to break in your boots quickly, the leather becomes damaged and a little weaker than before with this technique. Ok, so all of this sounds like really bad news. It is inevitable that some loss of strength and water damage to your tack will always happen just through normal day-to-day use. The thing to keep in mind is that the worst damage occurs with repeated significant water exposure. Yikes, does this mean you need to quit those rides through the waves at the beach or lose sleep over jumping into cross country water obstacles? No way! With a little awareness and care, you can really keep the impact on your saddle and leather goods to a minimum while still riding gleefully through all of the puddles you want! 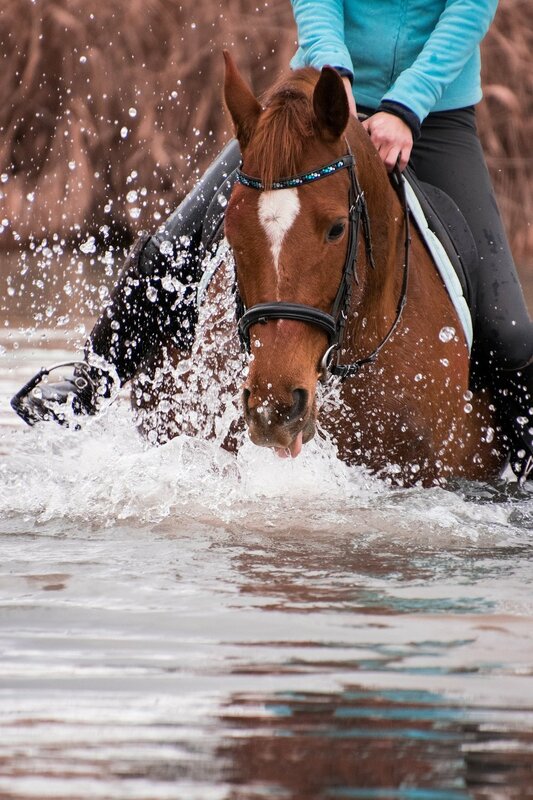 Like we said before, water is super sneaky, and it interacts with your tack probably more often than you even realize. Did you ever really think twice about dropping your bridle half submerged into a bucket of water in order to soak your bit clean? No judgement here; we’re guilty as charged on occasion, too! Here are a few easy tips and habits to get into in order to minimize and prevent water damage, helping your leather have a long and happy life. o Avoid saturating your leather. Don’t leave it in the rain or wash it down with a hose. Don’t put your leather in the washing machine or dishwasher. o Use water sparingly when cleaning your tack. For example, use a damp cloth, not a dripping wet cloth. o Need to get your bit clean? Instead of soaking it in a bucket, try washing it off under running water (wash rack, outdoor spigot, tack room sink) using a vegetable or nail brush to scrub off the stuck on green slime. We loop the reins and crown over our shoulder to help the bridle stay clear of the water stream and splashes. o If a bucket is all you’ve got to work with, only fill it with just enough water to cover the bit. Drape your bridle over the bucket without any slack so that the leather doesn’t fall into the water. o Wet boots? Try newsprint or tissue paper loosely stuffed in the foot to wick away moisture quickly. Electric boot dryers work wonders, too. Follow with leather cleaner and leather conditioner. o Cover your saddle with a saddle cover or blanket if you’re out in wet weather. Quarter sheets are amazing for a little saddle protection. If you tend to ride out frequently in the elements, it may be well worth investing in some rain sheets designed for riding and that have slots for your stirrups to come through. o Are your stirrup leathers or girth wet from splashing through waves, puddles, rivers, or water jumps? Towel off any excess water, and then apply leather cleaner. Give the leather and girth a light coating of leather conditioner to minimize leather shrinkage once the leather has dried. o Caught in a soaking storm? No problem; towel off the excess moisture right away so it isn’t absorbed. Let your tack rest uncovered in a well ventilated area in order to breathe and dry gently and gradually before storing. Terry towels and a fan work well for this. Don’t place your tack next to a heater or use a hair dryer – this causes all kinds of other problems (which we will talk about in an upcoming article in our series). o If you’ve gotten your leather soaked, clean it thoroughly immediately and apply a nice coat of conditioner once your leather has dried. This will help restore balance to the leather fibers and will help diminish rain spots. Additional buffing with a cloth will also help reduce rain spots. o If you need to dry your girth, stirrup leathers, martingale, bridle, or any leather you typically hang up to store, lay these items flat to dry. Gravity will work to stretch your wet tack if left hanging while drying, and we know that is not what you want! o Also, be sure to dry your tack, boots, and equipment in their natural shape and orientation so that they don’t deform. Do you see a theme with all of this? :) Ensuring the long-term health and happiness of your leather really starts with avoiding water as much as possible in the first place. This is, umm, pretty much impossible to always do, so the next best thing is preventing as much water damage as possible. In a nutshell, if your leather gets wet you should wipe off any excess water, thoroughly clean with a leather cleaner, let dry gradually in a well ventilated space, and then lightly coat with leather conditioner. Viola! We hope there is a rainbow and pot of gold at the end of your ride in the rain! **Be sure to keep an eye open for our next and second article in our Series coming out next month! Posted on March 20, 2019 by Teal and tagged Sterling Essentials Leather Care Leather Conditioner Leather Cleaner Leather Care Products Worst Enemies of Your Leather Water Damage Prevention Water Protection for Leather Equestrian. Have you ever noticed how your leather boots or half-chaps wrinkle and pucker with time? These wrinkles and sags are inevitable as the leather breaks in and conforms to the contours of our feet and legs. This is a natural part of leather aging and use. However, this sagging, dragging, and saddle-bagging of our lovely leather goods becomes even more pronounced when our leather loses it’s fiber strength (aka not nourished routinely) and when the wrinkles turn into rigid mountain ranges due to residual sweat, dirt, and grime. And yes, this does even happen to me, queen of the leather care routine! Ugh. What do do? Cleaning and conditioning is always key, and as Jackie Guezille illustrates so fantastically in her review of our products in the latest Wally the Pony blog, the results can be stunning. Botox for leather anyone? According to Jackie, our products are an absolute game changer in her routine, and we hope they will be in yours, as well! Why does blogger Jackie recommends a two step leather care process? How do our products stack up against some pretty nasty looking gear? Do our products strip out the dyes in your leather? See for yourself and more by checking out Jackie’s full review at https://wallythepony.wordpress.com/. Thank you, Jackie for this detailed tell-it-like-it-is on our products! Posted on December 18, 2018 by Teal and tagged leather care starter set Leather Care Leather Conditioner Leather Cleaner Sterling Essentials sterling essentials leather care lavender tack conditioner tack cleaner Tack essential oil horses boots half-chaps leather. If palm trees are on your daily horizon, then you know that Spectrum Saddle Shop is one of the THE places to shop for tack and apparel in Florida. We are delighted to share the news that our products are now fully stocked at this fabulous shopping destination, as well as in Spectrum’s premier mobile store! There is something so exotic sounding about doing your equestrian shopping from a mobile shop set up under blue skies and swaying fronds…..or perhaps we are just already mourning the approach of rainy, dreary days ahead in western Oregon. :) Regardless, be sure to stop in and visit Ellie and her crew for all of your needs! 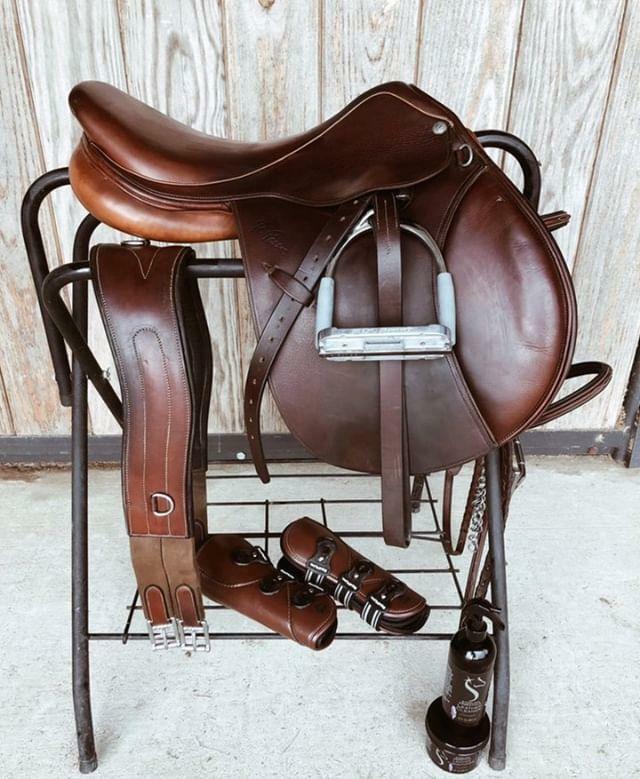 Posted on October 19, 2018 by Teal and tagged Sterling Essentials Spectrum Saddle Shop Leather Care Florida Equestrian Tack Retail.